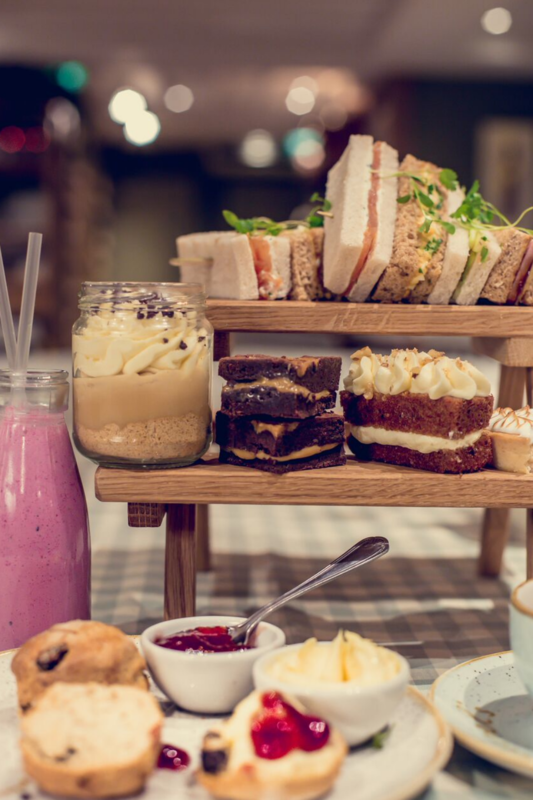 Dry Jan is well and truly over for those that partake, but let’s keep those good intentions lingering and find a few alternatives to the bottomless Prosecco brunches and head out for afternoon tea instead. It can be a very grand affair in some of the super luxe hotels in town, perfect for a special occasion but for a more accessible and affordable option take a turn into Old Compton Street and head for Muriel’s Kitchen. It’s very relaxed, the staff are lovely and know the menu well and to be honest quite possibly the best afternoon tea spot for people watching. The menu includes finger sandwiches of smoked salmon and cream cheese, egg mayo with watercress, the classic cucumber, Wiltshire ham and coastal cheese and pickle. Which we happily munched through but made sure not too full to enjoy the prettily presented cakes – freshly baked mini fruit scones served with clotted cream and strawberry jam, a lemon meringue tart, the cutest Little carrot loaf, brownie bites and my fav the banoffee pie jar. We had pots of Earl Grey and Chai but you can also choose from English breakfast, Camomile, Peppermint, Super Fruit, Green Tea, Jasmin, Rooibos or of course a perfectly chilled glass of Proseccco (maybe both). An ideal location to escape a serious day of West End shopping or maybe a pre matinee let’s be good as it’s still daylight refresh. Highly recommended – all little fingers stand to attention, you have an afternoon brew to attend.